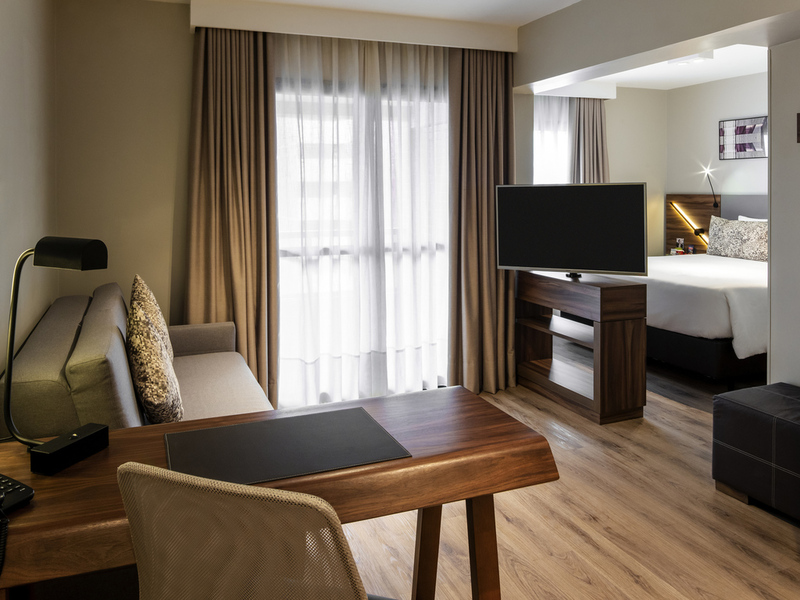 Mercure Curitiba Batel, located in the noblest region of the city, where there are trendy shopping malls, bars and restaurants. 17.6 km from the airport and 5 minutes from the city center. We have recently refurbished modern apartments with free Wi-Fi, International cuisine restaurant, gym, heated pool (up to a maximum of 26 degrees Celsius) and unique service that make the experience more enjoyable. Meeting rooms ideal for your event. Contact us! Recreation area w/renewed fitness center and heated pool (max. 26 degrees). Privileged location in the heart of the Batel district. Romantic and wedding night packages to make your stay unforgettable. We have several types of brand new apartments, ideal for business, leisure or families: Standard apartment, Superior apartment, Executive room, Executive suite with 2 double beds, Executive duplex suite. Standard Apartment with a king-size bed. Executive Apartment with a king-size bed and a balcony. Superior Apartment with a king-size bed and a balcony. Superior Apartment with a king-size bed, sofa bed and a balcony. Jag bor ofta här. Hotellet ligger i bästa området. God standard,bekvämt rum, bra service men slitet hotell. Hotellet skulle må bra av en uppfräschning.